Thank you so much for your comments! Please tell me what you topics you’d like to discuss. Thanks to Dr. Lustig for putting it all together and explaining the subject so well. Thanks to Samantha for getting it into print and for the references and website. One point I find puzzling is — Is fiber a true antidote, or merely a diluent? I do not see how the fiber affects the described intracellular liver metabolism. Am I missing something?? Thank you, Carl. I’m not sure about the fiber issue. Dr. Lustig mentions that fiber counteracts the way that fructose is not seen as a food, but that is not your question. Please post back if you have found an answer. What’s your next step? Might I suggest a PR campaign? Just look at what’s happening to PINK SLIME for example. Are you going to make Dr. Lustig’s Nature postings/publications available. I don’t subscribe and it’s prohibitively expensive for an individual in any event. Good point about pink slime. The difference may be that sugar is largely seen as innocuous (“empty calories”) while the ammonia used in pink slime is understood to be clearly toxic. As for the Nature article, I agree that it is expensive if bought online. However, your public library may have a database (that you can access online with your library card ID) that will carry the journal Nature. Perhaps I will do a thorough summary of the article and post it here on the site–thanks for the idea! Ever wonder what our grandparents thought about eating healthy? Awesome! Thanks so much for sharing this. The book, The China Study, by T. Colin Campbell, Cornell University, studies the cause of death in China, does some laboratory studies, and concludes that the only cause of cancer is from eating animal protein. That book has caused my family to decrease our consumption of animal protein. Thanks for your comment. I’ve heard of this study and will read the book before I say anything further! Thanks. I appreciate Dr. Lustig’s insights AND yours, Samantha. I am a proponent of eating REAL FOOD (cheese, eggs, animal protein, vegetables, nuts, etc) and avoiding all processed foods and all drugs including STATINS. The research community is hardly credible any more because of its cozy (and huge financial) relationships with the food and drug industries. Just look at the Olympics and note this year’s major sponsors. Where is the research community in all that madness?! The processed foods are killing us one by one. Sugar and Cancer: The Hidden Link? 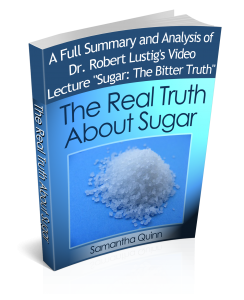 Dr. Lustig in Time Lustig explains myths about sugar. MSNBC: Regulate Sugar like Alcohol & Cigarettes? An MSNBC report on the call to regulate sugar.